Make sure that you have some as often as possible. Papaya was the only studied food found to halt breast cancer. Scientists studied 14 plant foods commonly consumed in Mexico to determine their ability to halt breast cancer cell growth. These included avocado, black sapodilla, guava, mango, prickly pear cactus (nopal), pineapple, grapes, tomato, and papaya. They also evaluated beta-carotene, total plant phenolics, and gallic acid contents and antioxidant capacity. 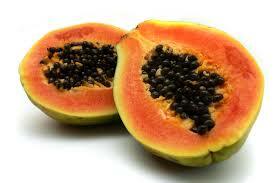 They found that only papaya had a significant effect on stopping breast cancer cell growth. Prostate cancer was the subject of a study in Australia that looked at 130 prostate cancer patients and 274 hospitalized controls. The scientists found that men who consumed the most lycopene-rich fruits and vegetables such as papaya were 82% less likely to have prostate cancer. In this study, green tea also exerted a powerful anti-cancer effect. relationship between cell cycle regulation and appropriate cell death. When cancerous cells die on schedule, they are no longer a problem. dormancy. (Forum of Nutrition, 2009). Enzymes (Vinegar) from papaya digest proteins including those that protect tumours. The fruit and other parts of the papaya tree, also known as the paw paw tree, contain papain and chymopapain, powerful proteolytic enzymes that facilitate chemical reactions in the body.They promote digestion by helping to break down proteins from food into amino acids that can be recombined to produce protein useable by humans. Proteolytic enzymes protect the body from inflammation and help heal burns. They do a good job of digesting unwanted scar tissue both on the skin and under its surface. after antibiotic use to replenish friendly intestinal bacteria that were the casualties in the war against the unwanted bacteria. When the intestinal tract is well populated with friendly bacteria, the immune system is strengthened, and can protect better against flu and cancer. Papaya contains fibrin, another useful compound not readily found in the plant kingdom. and destroy the defence shields of viruses, tumours, allergens, yeasts, and various forms of fungus. these rogue proteins, freeing up the immune system. Let’s ensure a slice of papaya every day in our diet. Papaya juice will be great. This entry was posted in Health and tagged anti cancer, health, papaya by Miss P. Bookmark the permalink.